Many thanks to Velocity Sports Equipment for working so hard to have my beautiful rig ready in time for Jump For The Rose Pinkfest Mini Boogie this year. The workmanship is beautiful. Thank you guys for making me the raddest container EVER!!! I also want to thank you guys for making me the raddest container EVER!!! Volkan sent me a few photos and it is gorgeous!! I'm really excited to get home and pick that beauty up! Again, thank you for all your help and the swag you sent with my t-shirt order! YOU GUYS ARE THE BEST!!! 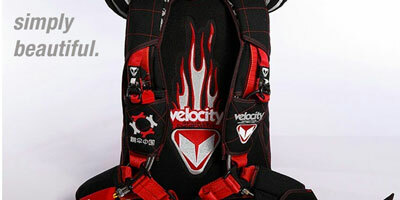 I cannot say enough about Velocity Sports Equipment. I love my Infinity. I never feel it on me until I'm under canopy. Nicole is so pleasant to work with! I love Infinity because it is quality over quantity. The quality is top notch. Plus, who doesn't love jumping the sexiest looking rig on the planet!? I get compliments all the time when I show up on wearing my rig. Infinity was my first rig and I doubt I will ever change. It's a comfortable fit with reliable gear. Nothing compared to an Infinity in blue skies. like emoticon Velocity Sports Equipment you know how to keep skydiving #scumbags like myself happy! Two jumps before my A-license I realized I'd never be able to afford to buy a rig if I rented them afterwards. Opting to buy a new one meant an 8-10 week lead time, to have it custom-made (i.e. no jumps for 2+ months! ), and and I couldn't have that! Adding only roughly 5% for rush processing, and a little extra to overnight the Cypres, they completed my container in 10 days! TEN DAYS!! And two of those days were a weekend! I found out afterwards it took 48 hours to make (i.e. 6hrs a day for 8 days straight). And it was in my hands in less than two weeks! LESS THAN 2WKS!!! I don't jump my Infinity because it's the most comfortable rig I've ever worn. I don't jump my Infinity because of how badass it looks! I jump it because a safe wingsuit deployment is the most important thing for me!!! Simplicity in complex systems is a must and the Infinity design accomplishes that easy. Integration of features not add-ons. Some of the features on other rigs seem to be just added onto the original design instead of actually integrating them into the overall design and function of the rig. Simplicity in complex systems is a must and the Infinity design accomplishes that easy. There's nothing I feel more safe and confident with than my Infinity. When flying in all angles and speeds I want that piece of mind knowing ALL my covers are secure and thanks to Velocity Sports Equipment I have it!!!!! Definitely the most comfortable and secure rig I've owned.